It's not just a dive cylinder... It's a FABER. Faber steel cylinders give you the quality and performance you expect and appreciate in a steel scuba cylinder. With one of the widest ranges of sizes in the market today Faber cylinders offer you the needed volume and flexibility to maximise your bottom time. The Scuba Doctor has available the full range of Italian made 232 bar Faber Steel Cylinders. We typically have Faber 3, 10.5, 12.2 standard and 15 litre steel tanks in stock on the shop floor and order in anything else. All 232 bar Faber Steel Cylinders are supplied oxygen clean direct from the factory, making them suitable for O2 service. As standard we supply the Italian made San-o-Sub DIN to Yoke convertible, cross-flow valve with 232 bar Faber cylinders. The valve has the shorter 200 bar, female DIN connection with 5 threads to connect your first stage DIN scuba regulator. The valve regulator connection comes complete with a threaded DIN to Yoke insert, which means it can equally be used for both INT bracket (Yoke) or DIN regulator connections. However, you can also order your cylinder with a range of other valve options, or unvalved. If you are planning to use the cylinder with Enriched Air Nitrox (Nitrox) mixes up to 100% oxygen, it's essential for the safety of the cylinder user and the person filling the cylinder that the valve be oxygen cleaned and prepared with special o-rings, seats, and grease designed for exposure to pure oxygen. The cylinder should then be banded with the familiar yellow and green Nitrox band/wrap/sticker, and an Oxygen Clean 'In Test' inspection sticker applied. The Scuba Doctor can do all of this for you as an add-on service. Most Faber 232 bar steel cylinders from The Scuba Doctor are supplied with a self-draining flexible PVC cylinder boot to fit the round bottomed Faber tanks already installed. This protects the bottom of your cylinder and provides a streamlined profile for tank racks or doubling tanks. 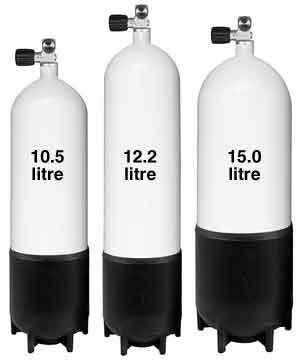 All scuba tanks for delivery are sold without the valve fitted and EMPTY due to restrictions in place on the transportation of high pressure cylinders. If you are picking up your cylinder from the dive shop, the valve will be fitted for you and we will include a FREE air fill. 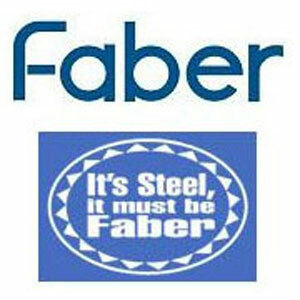 Note: All Faber Steel Cylinders we sell comply with Australian Standards.